The word “trump” has rich meaning in the English language and in the Bible. 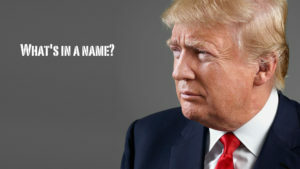 Is Donald Trump’s name a prophetic sign from God? In today’s program I’ll be discussing the significance of the name of our newly elected US President, Donald Trump, in relation to Bible prophecy for the end time. It’s fascinating that Trump’s name is so rich in meaning, both in the secular meaning of the word and in the biblical meaning of the word. Personally I don’t think this is a coincidence. I submit to you that Donald Trump’s name might be a sign from God with prophetic meaning: both the secular meaning of the word but especially the biblical meaning of the word. I believe that God might have a very important end time message for His people through the name of Donald Trump that we’re going to reveal both from the dictionary of the English language as well as from the scriptures. Only God, who knows the end from the beginning, is able to provide this kind of sign that is fully consistent with Bible practice. By contrasting both the secular and the biblical meaning and associations of the word “trump” we’ll get additional insight into the end time scenario of Bible prophecy that’s being played out right now on the world stage. But I need to warn you that our conversation is going to be around some very subtle spiritual nuances so I need to be totally tuned in and focused to make sure that you get it! You’ll get some really critical understanding from this study – you want to listen through to the end. “In the Revelation all the books of the Bible meet and end” (E.G. White). Get ready for some strong meat today as the Apostle Paul would say, because the days of milk are over. We need to become wise unto salvation and go ever deeper into God’s Word. Contrary to what many prophecy teachers would have us believe, the truth is that the United States plays a leading role in endtime Bible prophecy. Not Israel, not Islam, but the US will be leading out in the fulfillment of Bible prophecy. That doesn’t mean to say that historic and unprecedented things won’t happen in the rest of the world including Israel and Islam, because they’re happening even now. It simply means that we particularly need to watch and study what’s happening in the US because this country is the nerve of the war between Jesus and Satan. The US is still in upheaval after the recent presidential elections, which every single news analyst and commentator has called “historic”. I would agree with that statement, and I would add that the Lord used this past election to make a statement. Do you remember in 2013 when Pope Benedict 16 resigned? A few hours after Pope Benedict announced his resignation, in itself a historic occurrence that hadn’t been seen in 600 years, a bolt of lightning struck the Vatican basilica. That was a sign from God, saying wake up and watch, what’s happening here is significant. Something very similar happened with the 2016 US presidential election and Donald Trump’s victory. In what ways was the US presidential election noteworthy that we should sit up and take notice? 1) One of the candidates was a Seventh-day Adventist. Dr. Ben Carson is a practicing Seventh-day Adventist who ran for president and was eliminated in the primaries. His faith generated a lot of interest and controversy, with Donald Trump asking “Who are Adventists?” All of a sudden this small and very unique Christian denomination was in the limelight. We’ll learn in another study why this is significant. 2) The real issue at stake in this election was globalism vs. nationalism. The global powers are like the Tower of Babel builders. They’re rising up in opposition to God’s stated will. And they were rallying to what they thought was a landslide victory. Instead, the people put Donald Trump with his nationalist agenda in office, and it’s interesting to note that 52% of Catholics and 81% of Protestants voted for Donald Trump. (Source: cruxnow.com, a Catholic news website). Did God put Trump in power as a delaying tactic to the global elite’s plan? Is this another example of God asking the four angels to hold back the winds of strife until His people are sealed? That’s a fair question to ask. and has great Biblical significance. It’s significant that his name has meaning in both the material world and the spiritual world. Let’s explore that in more detail to be able to make some connections. If you look up the word “trump” in any English language dictionary, you’ll find that it has several meanings. Associated with card games and winning. A trump card is a valuable resource that may be used, especially as a surprise, in order to gain an advantage. Often a decisive, overriding factor or final resource. To trump means to surpass something by saying or doing something better. An advantage held in reserve until needed. Also to get the better of someone using a hidden resource. The expression “to come up trumps” means to have a better performance or outcome than expected. What is that advantage that Trump had in the election that gave him the victory? Possibly the polite support of the silent majority who didn’t argue or try to persuade anyone but simply went to the polls and voted. This was his decisive, overriding factor and final resource in that it escaped notice during the campaign and only became apparent in the vote counting. In Hebrew the meaning of the name Isaac is laughter. Remember how Sarai laughed when God announced that she would have a son? The Lord instructed her to name him Isaac. One of the most extraordinary names of all is Methuselah. The name Methuselah has prophetic meaning. In the Old Testament Methuselah was the son of Enoch who walked with God and whom God translated to heaven without dying. The Lord told Enoch that as long as his son was alive, the judgment of the flood would be withheld; but as soon as Methuselah died, the flood would be sent forth. Enoch named his son to reflect this prophecy. The name Methuselah comes from two roots: muth, a root that means death, and shalach, which means to bring, or to send forth. Thus, the name Methuselah signifies, his death shall bring. And, indeed, in the year that Methuselah died, the flood came. His death brought the flood as prophesied. Associated with war or destruction, an alarm or an alert that precedes a war, an invasion, or some other form of destruction. The trumpet calls the people to be vigilant, to assemble, to muster their forces against an attack. 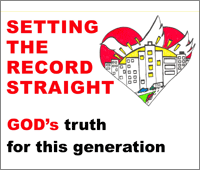 Associated with judgment for sin and transgression and for turning away from God. Often the judgment came by the sword, meaning by war, and often the danger came from the North, from the Kingdom of Babylon. This is significant because of the prophecy in Daniel 11 regarding the King of the North, referring to the anti-christ. Associated with God coming down from heaven. In the Old Testament the trumpet blared when the Lord came down to Mount Sinai to speak the Ten Commandments to the children of Israel (Exodus 19 – 20). There was smoke and fire on the mountain as well as a great earthquake. Equally in the New Testament the trump is associated with the Second Coming of Christ, when He will come with the voice of the archangel and the trump of God to gather up His elect from the four winds (1 Thessalonians 4). As happened on Mount Sinai there will be smoke and fire and a great earthquake that will move the islands out of their place, so big an earthquake it will be. Associated with the voice of God. At Mount Sinai the blast of the trumpet was co-mingled with God’s voice (Exodus 19:19). In Zechariah 9:14 the Lord Himself blows the trumpet. Christ comes with the voice of the archangel and the voice of God (1 Thessalonians 4:16). Also associated with the voice of prophets. “Behold, I tell you a mystery: We shall not all sleep, but we shall all be changed—in a moment, in the twinkling of an eye, at the last trumpet. For the trumpet will sound, and the dead will be raised incorruptible, and we shall be changed. For this corruptible must put on incorruption, and this mortal must put on immortality” (1 Corinthians 15:51-53). This study of the trumpets is wonderfully rich, but we can only study a small sampling here. But all scriptures related to trump or trumpet are confirming and reinforcing the themes we identified earlier: war, judgment by the sword, impending destruction, call for God’s people to assemble, end of the world, God coming down from heaven and speaking to the people or speaking through His prophets. For God’s people who are walking with Him the trumpet sounds the victory, as in the tumbling of the walls of Jericho, and the gathering of God’s faithful people at Jesus’ Second Coming. But for those who are unfaithful to God the trumpet always signals destruction. Let’s go back now to what we were saying about the secular meaning of the word trump. It’s associated with games and winning, having a decisive advantage. Interesting that we can see how that’s played out in President Trump’s own life and successful career as a businessman. But I want us to take a step back and look at the big picture. Trump is very smart and was able to garner the vote of a majority of Christians. According to some reports he’s had a recent conversion experience, and that may very well be. Did you notice how at the inauguration Trump had a bigger than normal team of religious leaders praying for him? He had a Jewish rabbi, a Catholic priest, an Evangelical pastor and a female spiritual advisor. Trump may or may not be religious, but he surrounded himself with a very representative group of religious leaders. What’s the connection here? “Then I saw another beast coming up out of the earth, and he had two horns like a lamb and spoke like a dragon. And he exercises all the authority of the first beast in his presence, and causes the earth and those who dwell in it to worship the first beast, whose deadly wound was healed. He performs great signs, so that he even makes fire come down from heaven on the earth in the sight of men. And he deceives those who dwell on the earth by those signs which he was granted to do in the sight of the beast, telling those who dwell on the earth to make an image to the beast who was wounded by the sword and lived. He was granted power to give breath to the image of the beast, that the image of the beast should both speak and cause as many as would not worship the image of the beast to be killed. He causes all, both small and great, rich and poor, free and slave, to receive a mark on their right hand or on their foreheads, and that no one may buy or sell except one who has the mark or the name of the beast, or the number of his name” (Revelation 13:11-18). In other words, what we’re waiting for prophetically is for the US – working through an alliance of apostate Protestantism allied with the Papacy – to restore life and power to the beast, the anti-christ, that is to say, the Roman papacy. This process has already begun, and it will come to full manifestation through the daughters of the harlot church, that is to say the Protestant denominations that are pledging allegiance to the Vatican. The Protestant churches (also called the false prophet in the Book of Revelation) will restore credibility and power to the papacy by uniting with Rome. Again, this process already began formally in June 2014 with the evangelical meeting where Pope Francis made a video appearance and Kenneth Copeland led the group in praying in tongues over the pope. In August 2016 the Lutheran Church officially defected from “sola scriptura”, or the scriptures alone as the source of Christian truth. This year is the 500th. anniversary of the Protestant Reformation, when Martin Luther posted his 95 theses on the door of a Catholic cathedral in Wittenberg, Germany. The pope will join with the other Protestant leaders to celebrate the end of the Protestant movement. This leads me to believe that events will continue to accelerate, bringing together Rome and most Protestant denominations in a counterfeit unity – counterfeit because it’s not based on God’s truth but on man-made tradition. What’s the connection between the Protestant apostasy and Donald Trump? I believe that the conditions are ripe for the beast’s wound to be completely healed during Trump’s presidency. However, Donald Trump and Pope Francis so far don’t seem to be each other’s fans, given Trump’s stance on immigration and his nationalistic agenda, whereas Pope Francis is pushing a One World Government without frontiers. The beast with horns like a lamb that speaks like a dragon, working through the false prophet that is apostate Protestantism, will ultimately impose religious persecution in America to destroy God’s remnant people who keep the Ten Commandments and therefore worship on the Sabbath Day. Of the two powers at war in this great controversy between God and the devil, whose trump card will Donald Trump be? Will the globalists ultimately succeed in removing Trump? We shall see. Two powers are at war in the universe and both may use the same agent to accomplish their purpose. We established earlier that the word trump has deep biblical and prophetic significance. Is God trying to tell us something with President Trump’s name? That the world is soon coming into judgment as prophesied? That we’re getting closer and closer to Second Coming of Christ and the end of the world? The fact that God may use Donald Trump’s name as a sign doesn’t necessarily mean that God is endorsing Trump’s actions and speaking or working through him, although we can’t altogether rule that out. I personally believe that the Lord is using President Trump as a sign, as a signpost on the way to the end, a final warning calling us to action. When we receive a message from God, we don’t look at the messenger, we simply receive the message and evaluate it on its own terms: Is this truth? Is it biblical? Does it come from God? If the answer is yes, then we embrace the message regardless the messenger. Didn’t God speak through a donkey? And by the way, Balaam the prophet who the devil tried to use to curse Israel is a good example of someone who was used both by the devil and by God. What is God calling us to do? First of all, He’s calling His watchmen to blow the trumpet: “Cry aloud, spare not; Lift up your voice like a trumpet; Tell My people their transgression, And the house of Jacob their sins” (Isaiah 58:1). The days of smooth and deceptive prophesying are over. Those preachers and teachers who deceive the people with smooth words will have their day of reckoning. The Book of Ezekiel Chapter 3 clearly warns us watchmen on the wall that if we fail to warn the people of their sins, whether it be the righteous or the wicked, their blood will be upon our heads. Let’s read the verse: “Son of man, I have made you a watchman for the house of Israel; therefore hear a word from My mouth, and give them warning from Me: When I say to the wicked, ‘You shall surely die,’ and you give him no warning, nor speak to warn the wicked from his wicked way, to save his life, that same wicked man shall die in his iniquity; but his blood I will require at your hand. Yet, if you warn the wicked, and he does not turn from his wickedness, nor from his wicked way, he shall die in his iniquity; but you have delivered your soul” (Ezekiel 3:17-19). Then in verses 20 and 21 the Lord says the same thing about the righteous. I don’t want the blood of anyone to be on me, righteous or wicked. Therefore I don’t speak smooth words. I blow the trumpet and tell you the truth as it’s stated in God’s Word. And He relents from doing harm”. This is the most critical part of today’s teaching. If anything I’m using Trump as a springboard for us to talk about the sanctuary. In a previous program called “Pattern of Heavenly Things” we discussed the prophetic significance of the Hebrew sanctuary not only for the ancient Jewish people but more importantly for our generation. The Hebrew sanctuary is the foundation of our Christian faith. The sanctuary was a system of “types and shadows” that symbolized the entire plan of salvation. It pointed to the ministry of Jesus: not only His death on the cross but His intercession in heaven on our behalf as well as His coming in glory to take His people home, thereby completing the plan of redemption. Today I want to shine the light on this very important aspect of the trump and the trumpet, which is in connection to the Hebrew sanctuary and the Jewish feasts. But before we make that connection to the feasts, I want to establish clearly in your mind the importance of the sanctuary and its relevance to us and to Bible prophecy for the end time. It’s impossible to understand the Books of Daniel and Revelation without understanding the ancient Hebrew sanctuary. So many of the symbols and clues come from the sanctuary service! In the Book of Hebrews the apostle Paul explains the deeper meaning of the whole sanctuary system. Sometimes this system is even referred to as the Hebrew economy, because the daily life of ancient Israel was structured around the daily and yearly sacrifices, the weekly Sabbath and the yearly feasts. This whole system is also known as the ceremonial laws. Very few of the children of Israel or even of the priests understood that the rituals and ceremonies and feasts pertaining to the sanctuary held a deeper meaning. They were in fact pointing to the future sacrifice of the Messiah. Not only did they fail to understand the symbolism of the sanctuary, but they also believed that after the death of Christ that entire system was still relevant and mandatory for all believers including the gentiles. The Jews of the time of the disciples wanted to continue celebrating the Hebrew feasts and offering the daily sacrifices after the death of Jesus, not understanding that His perfect sacrifice rendered the entire sacrificial system absolutely unnecessary, totally irrelevant and completely obsolete. The Jews even wanted to impose the sanctuary system on the newly converted Gentiles. So Paul wrote the Book of Hebrews to rectify all of these misconceptions among the Jews. He explained how Jesus’ perfect, one-time sacrifice had supplanted the sacrifices and feasts and how at Jesus’ ascension the heavenly sanctuary had replaced the earthly sanctuary, that from its creation during the days of Moses it was only a type and shadow of the real sanctuary in heaven. “For the law (Note: he’s referring to the ceremonial law) having a shadow of good things to come, and not the very image of the things, can never with those sacrifices which they offered year by year continually make the comers thereunto perfect. For then would they not have ceased to be offered? Because that the worshippers once purged should have had no more conscience of sins. But in those sacrifices there is a remembrance again made of sins every year. For it is not possible that the blood of bulls and of goats should take away sins”. Then he goes on to explain, quoting Jesus, that God wanted no more sacrifices and offerings for sin as in the ceremonial law because as we just read the blood of bulls and of goats can’t take away sin. Instead the plan of salvation required a perfect, permanent, once and for all sacrifice in the body of God’s Son: “Then said he, Lo, I come to do thy will, O God. He taketh away the first (referring to the animal sacrifices), that he may establish the second (referring to Jesus’ sacrifice). By the which will we are sanctified through the offering of the body of Jesus Christ once for all. And every priest standeth daily ministering and offering oftentimes the same sacrifices, which can never take away sins: But this man, after he had offered one sacrifice for sins for ever, sat down on the right hand of God; From henceforth expecting till his enemies be made his footstool. For by one offering he hath perfected for ever them that are sanctified” (Hebrews 10:9-14). The imperfect sacrifices and offerings had to be offered continually, twice a day and throughout the year, because they were not able to permanently remove sin. They were presented as a temporary substitute for the future sacrifice of Jesus and had to be constantly renewed. Even the cleansing of the sanctuary on the Day of Atonement was a yearly reoccurrence. Once Jesus’ sacrifice was presented and was accepted by the Father, the entire earthly sanctuary system became obsolete. The tearing of the veil when Jesus died on the cross. God was making a statement that the levitical priesthood had no more reason for being. The priesthood was now to be transferred to Jesus – the High Priest of the Order of Melchisedek – and translated to the real sanctuary in heaven. This was the death of the system of types and shadows. All of this is also explained in Hebrews 7 and 9 using slightly different language. On the Day of Pentecost tongues of fire fell upon the disciples’ heads. This was symbolic of the way fire came down from heaven to burn a sacrifice or offering when it was acceptable before God. This happened to the children of Israel during their wanderings in the desert (Leviticus 9), it happened to Gideon (Judges 6), King David (1 Chronicles 21) and also at the dedication of the temple built by Salomon (2 Chronicles 7), and when Elijah had the controversy with the prophets of Baal (1 Kings 18). The tongues of fire that fell upon the disciples in the Upper Room signified that the Father had accepted Jesus’ sacrifice. Regardless of what some Christian ministers are teaching on Christian television, we do not have to keep the Jewish feasts. It’s important to understand their symbolism as part of the overall sanctuary, which in turn is symbolic of God’s plan of salvation for mankind. But that’s the whole point of the Book of Hebrews: the ceremonial laws were taken away and replaced by Jesus’ death on the cross. That’s what is meant in Hebrews 10:9: “He taketh away the first, that he may establish the second” meaning that God took away the ceremonial law of recurring feasts and sacrifices to establish Jesus’ one-time perfect sacrifice. These Jewish holidays may appear like a way to come closer to God, but in fact they’re a false doctrine and an insidious attack against Jesus. Hebrews 7:12 states: “For the priesthood being changed, there is made of necessity a change also of the law”. So both the priesthood and the law were changed after Jesus’ death. The levitical priesthood was replaced by Jesus the High Priest of the Order of Melchisedech. The law that was replaced is the ceremonial law, not the divine law (Ten Commandments). Please don’t get confused between what was abolished and what remained. What was abolished was the ceremonial law of sacrifices and offerings and of the yearly feasts, which included the yearly Sabbaths (like the Unleaveaned Bread Sabbaths, the Pentecost Sabbath, the Trumpets Sabbath, the Tabernacles Sabbath and the Atonement Sabbath). All of those feasts are abolished. The weekly Sabbath on the other hand remains unchanged because the divine law – the Ten Commandments – remains fully in effect. Remember that Jesus said: “Think not that I am come to destroy the law, or the prophets: I am not come to destroy, but to fulfill. For verily I say unto you, till heaven and earth pass, one jot or one tittle shall in no wise pass from the law, till all be fulfilled. Whosoever therefore shall break one of these least commandments, and shall teach men so, he shall be called the least in the kingdom of heaven: but whosoever shall do and teach them, the same shall be called great in the kingdom of heaven” (Matthew 5:17-19). The only law that was nailed to the cross was the ceremonial law of types and shadows that pointed forward to the Messiah. 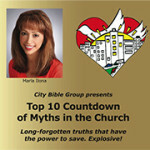 The Ten Commandments are still binding for all Christians. The fourth Commandment where God instructs us to keep the weekly Sabbath holy points back to Creation and was given to all mankind in the Garden of Eden. It wasn’t only for the Jews. OK, we had to lay all that groundwork in order to understand the significance of a very important prophecy in the Book of Daniel that is both the longest time prophecy in the Bible and it’s also the last prophecy given with a start and end date. In Daniel Chapter 8 we read this very important exchange that Daniel overheard in a vision and he himself didn’t understand it: “Then I heard one saint speaking, and another saint said unto that certain saint which spake, How long shall be the vision concerning the daily sacrifice, and the transgression of desolation, to give both the sanctuary and the host to be trodden under foot? And he said unto me, Unto two thousand and three hundred days; then shall the sanctuary be cleansed” (Daniel 8:13-14). In prophecy a day equals a year, this is called the “day/year principle” of prophetic time reckoning. Therefore the 2300 days given in the dialogue between the saints that Daniel overheard is counted as 2300 years. That prophecy started counting in the year 457 BC when King Artaxerxes signed a decree to both rebuild the Jewish temple and restore Jerusalem’s government. This is described in the Book of Ezra Chapter 7. If you count 2300 years from 457 BC the 2300 years end on the Jewish Day of Atonement of 1844, that is to say on October 22, 1844. The Day of Atonement is the yearly feast during which the high priest cleansed the sanctuary from the sins of the people that had accumulated during the year. This is what the two saints were talking about: “Then shall the sanctuary be cleansed”. What this prophecy is actually telling us is that on October 22, 1844 Jesus moved from the Holy Place into the Most Holy Place of the heavenly sanctuary. This prophecy is not referring to any earthly sanctuary because there wasn’t one at the time the prophecy was given and there wasn’t one when the prophecy was fulfilled. It’s referring to the only sanctuary that exists now, the heavenly sanctuary. And the cleansing of the sanctuary is the sign that judgment has begun in heaven. What does this mean for us? It means that right now we’re living in a time of judgment. We’re living in a protracted Day of Atonement, which in ancient Israel was a day of judgment, a day of fasting and repentance. The Day of Atonement is Yom Kippur in Hebrew. It’s the most sacred and solemn day of the Hebrew religious calendar, a holy convocation where all work is forbidden. It was characterized by the blowing of the Shofar or the Hebrew trumpet. Yom Kippur is celebrated on the tenth day of the seventh month, Tishrei. First, unlike other Jewish feasts such as the Passover or Pesach in the spring that celebrates the deliverance from Egypt, Yom Kippur doesn’t commemorate any event in Jewish history. Its only purpose was for God’s people to assemble in prayer and fasting and to follow the movements of the high priest who was inside the sanctuary, inside the Holy of Holies, cleansing the sanctuary with the blood of the sacrificial goat offered for that purpose. The second interesting fact about Yom Kippur or the Day of Atonement is that it’s preceded by the Feast of Trumpets. This Feast of Trumpets is often referred to as Rosh Hashannah but its real name is Yom Teruah, a day of blowing the trumpets. It’s celebrated on the first day of Tishrei. The Feast of Trumpets is described in Leviticus 23:23-25 and Numbers 29:1: “And in the seventh month, on the first day of the month, ye shall have an holy convocation; ye shall do no servile work: it is a day of blowing the trumpets unto you”. “Also on the tenth day of this seventh month there shall be a day of atonement: it shall be an holy convocation unto you; and ye shall afflict your souls, and offer an offering made by fire unto the Lord. And ye shall do no work in that same day: for it is a day of atonement, to make an atonement for you before the Lord your God. For whatsoever soul it be that shall not be afflicted in that same day, he shall be cut off from among his people. And whatsoever soul it be that doeth any work in that same day, the same soul will I destroy from among his people. Ye shall do no manner of work: it shall be a statute forever throughout your generations in all your dwellings. It shall be unto you a sabbath of rest, and ye shall afflict your souls” (Leviticus 23:27-31). Why is this significant for us? This is the day we’re living right now. We’re living in an extended Yom Kippur. On the Day of Atonement of the year 1844 Jesus moved from the Holy Place of the Heavenly Sanctuary to the Most Holy Place to perform the work of judgment. God’s people are being judged in heaven right now, because all heaven needs to know who Jesus is bringing with Him to heaven when He comes again to gather His people. Jesus said: “And, behold, I come quickly; and my reward is with me, to give every man according as his work shall be” (Revelation 22:12). Some additional confirmation that God still times key events according to the sanctuary calendar: Rabbi Jonathan Cahn has made a very good demonstration of that regarding the 7-year Shemitah cycles and the Jubilee year. The Pope’s reception in the White House by President Obama happened on September 23, 2015 during Yom Kippur. We’re living in a very solemn time. This is a time of repentance, of true seeking of the Lord, of prayer and fasting. We need to be afflicting our souls and investing all of our time in God’s Kingdom, not in the things of this world. The Bible says: “For whatsoever soul it be that shall not be afflicted in that same day, he shall be cut off from among his people” (Leviticus 23:29). I’m not surprised that the Lord is giving us a warning in Trump’s name. We shouldn’t speculate on the exact day and hour. The only thing that you and I need to understand is that we’re already living in the time of judgment and that we need to be prepared for the Second Coming of Jesus. That day will come as a thief in the night. But it shouldn’t surprise the children of light. None of us knows when probation will close for mankind, but we do know that, as was in the days of Noah, probation will close before the end. When God closed the door of the ark with Noah and his family and all the animals inside, it didn’t rain for 7 days. That seemed like a long time for Noah and his family and severely tested their faith. Those who were outside mocking didn’t know that the door of mercy was shut. Their fate had been sealed. When it began to rain 7 days later the flood took them all away: “And (they) knew not until the flood came, and took them all away; so shall also the coming of the Son of man be” (Matthew 24:39). The Book of Revelation talks about the seventh angel which has the seventh and last seal: “But in the days when the seventh angel is about to sound his trumpet, the mystery of God will be accomplished, just as he announced to his servants the prophets” (Revelation 10:7). Here I’m deliberately using the NIV because it’s a better translation of this verse. The NIV and the NKJV got this one right. Before beginning to blow the last trumpet, the mystery of God, which is the plan of salvation, will be accomplished. After that seventh angel begins to sound the last trumpet there is no more salvation. That’s what Jesus meant when He said in Revelation 22:11: “He that is unjust, let him be unjust still: and he which is filthy, let him be filthy still: and he that is righteous, let him be righteous still: and he that is holy, let him be holy still”. “And the seventh angel sounded; and there were great voices in heaven, saying, The kingdoms of this world are become the kingdoms of our Lord, and of his Christ; and he shall reign for ever and ever. … And the nations were angry, and thy wrath is come, and the time of the dead (Note: this refers to the wicked dead), that they should be judged, and that thou shouldest give reward unto thy servants the prophets, and to the saints, and them that fear thy name, small and great; and shouldest destroy them which destroy the earth. And the temple of God was opened in heaven, and there was seen in his temple the ark of his testament (Note: the ark contains the Ten Commandments): and there were lightnings, and voices, and thunderings, and an earthquake, and great hail” (Rev 11:15,18-19). The big picture of key end time events as described in the Bible reveals the beautiful tapestry of God’s plan of salvation for mankind. The redemption story is woven into the fabric of every Bible story and even every verse of scripture. How can we not surrender to a God who loves so much and who has given so much to redeem us? How can we not love our Savior, who is the center of all Bible prophecy? But there’s an enemy who’s lured us into slumber. Wake up! Wake up! The trumpet is sounding the alarm. The trumpet is the voice of God Himself. “Shall a trumpet be blown in the city, and the people not be afraid?” (Amos 3:6). The blast of the trumpet should elicit godly fear. Work out your salvation with fear and trembling (Philippians 2:12). God is calling us to repentance. We have to forsake sin and the ways of the world. We need to seek Him daily and do His work with whatever talents and resources He has gifted us. We need to congregate with other believers and intercede for one another. Prayer needs to become a way of life. We need to spend time in the Word to protect ourselves against the deceptions of the counterfeit signs and miracles that Satan is preparing. We’re living in the time of sealing. God is placing a seal on the foreheads of His faithful people before the winds of strife are unleashed. I pray that we may all receive the seal of God on our foreheads. Tagged Apostle Paul, beast, Bible, biblical, catholic, ceremonial law, church, Daniel, Day of Atonement, dragon, election, Ezekiel, false prophet, Feast of Trumpets, fire, flood, globalism, God, heaven, Hebrew, Hebrew sanctuary, Hebrews, Holy of Holies, Holy Place, Jeremiah, Jesus, Jewish, Jewish calendar, Jewish feasts, Joel, Judgment, lord, Luther, Lutheran, Methuselah, Most Holy Place, name, nationalism, Noah, papacy, Pentecost, Pope, prophecy, prophetic, protestant, repentance, Revelation, Sabbath, sacrifice. offering, saints, sanctuary, sealing, Second Coming, sign, Trump, trumpet, United States, US, Vatican, Yom Kippur.